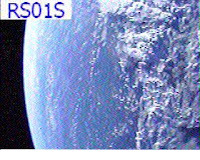 ARISSat-1 recently lapped the International Space Station and will be in a period of minimal eclipse (greater period of being in sun) starting around Nov 9 through Nov 12. 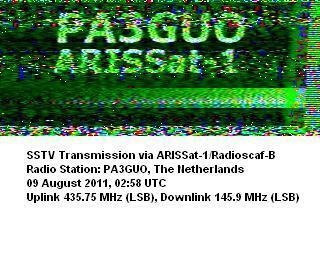 Ground operators with early evening passes will have a good chance of hearing and using ARISSat-1 around this time. Operating times should be good for stations worldwide during the mid day to early evening time periods. Give it a shot and show off to some school kids while you can. It appears that the current orbit of ARISSat-1 being mainly illuminated during Southern hemisphere passes has greatly reduced the number of captured images due to less participants in that part of the world . 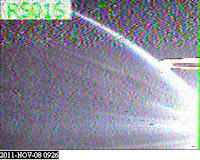 Ones that are being captured are of a lesser quality that received earlier. 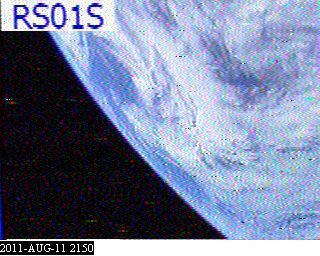 The orbit is slowly starting to favor afternoon and evening passes in the Northern hemisphere so we should start seeing an increase in images. This image was captured by ZS6BMN. I can hardly wait until some schools start trying to capture images as some great ones are being received by folks all around the globe. 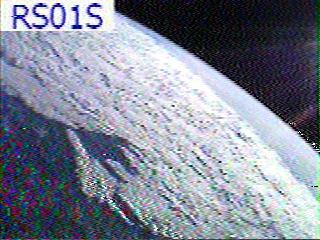 This image shows land mass and ocean will a few clouds and was received by IW2AGJ. Can you tell where in the world this are is located? 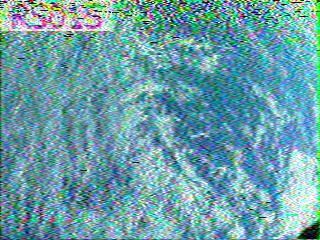 Images like this one are still being transmitted by ARISSat-1 during the day. 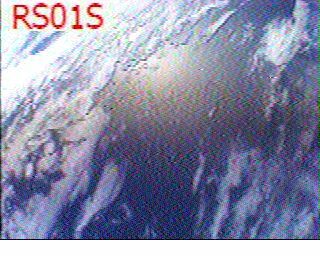 Many midday to late afternoon passes will have several images being sent by the satellite. This image received by KD8CAO over North America has a nice sun glint effect. ARISSat-1 continues to operate as long as the solar panels are converting enough energy to provide operations. 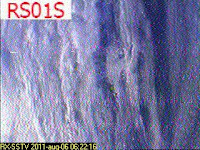 This image of clouds was received by VK2DAG on Aug 21. 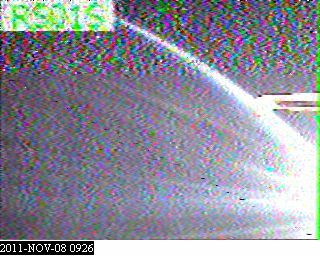 At least one instance of a male telemetry voice was reported and this occurs when the SD card can no longer be read. The system appears to have reset after that as follow on reports indicated the system was back to the female voice. I have taken a large number of the images that ARISSat-1 has captured and been received by numerous ground stations and compiled them into a "view of the world" plus a few of the other images that have been transmitted and received. 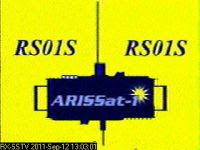 The ARISSat-1 website posted that the battery has not failed in a shorted state. That is good news in that it means the system can continue to operate when voltage levels from the solar panels permit. 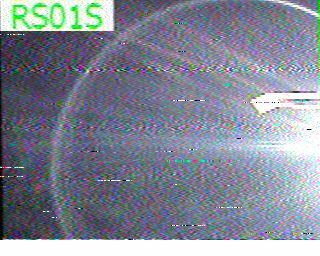 Images are still coming in but at a slower rates since the satellite does not transmit during eclipse periods. 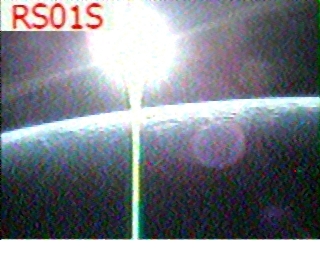 An interesting lens flare image taken by the top looking camera and was received by VU2UKT on Aug 14. 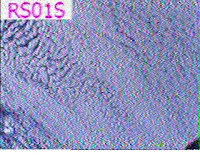 This very high quality image was received Aug 11 by ZL2BX. The battery system on ARISSat-1 has degraded rapidly and is now dropping low enough to reset the internal control system. The system is still functional but will take longer to come up to the minimum voltage for high (or full) duty cycle operations. This will reduce your chances of hearing the satellite during the day as it may only have enough power for the low duty cycle transmission mode. 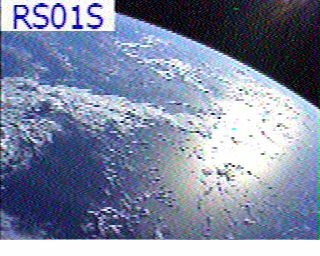 Not sure if the novelty of images from space is wearing out or if the satellite being in low power mode a bit more often is the reason but the number of images being submitted to the http://www.amsat.org/amsat/ariss/SSTV/ site is dropping off quite a bit. 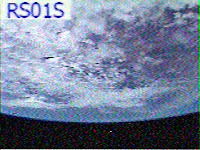 Images that are not selected for publishing on the main page are still available and posted to the archives at http://www.amsat.org/amsat/ariss/SSTV/archive.php with the most recent ones on page 1 and older postings on subsequent pages. 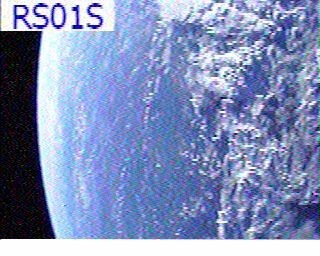 Looking forward to seeing more images from ARISSat-1. 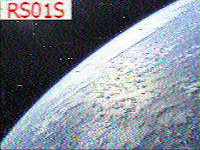 This image was received by JJøLTH while ARISSat-1 was over Asia. 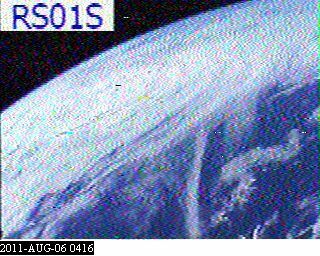 It appears to show some land features under and around the clouds. Here is an SSTV image that was sent through the linear transponder by PA3GUO using 435.75 (LSB) for the uplink and 145.9 (LSB) on the downlink. 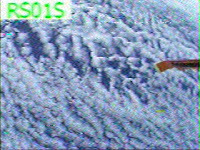 Signals from the satellite appear to be improving as the spin rate begins to slow. Several nice images were captured over the weekend. The first one (left) was received by JJøLTH and appears to show some land. The second one (below) was received by HA6KVC and shows another striking cloud view. The team now has a website that shows received telemetry from the satellite. This is one of the nicest images I have seen yet. A superb shot captured by ON4CCM over Europe on Aug 6. 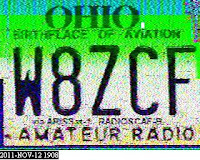 Here is the best image I could find to date with a red callsign. I just happened to have posted the other 3 color examples previously. This image was captured by NøJY during a pass over North America on Aug 4. The color of the callsign in the upper left of the image indicates which of the 4 cameras took the photo. 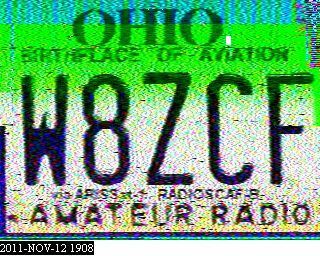 Red callsign [-Y pointing camera, mirror reverses image]. 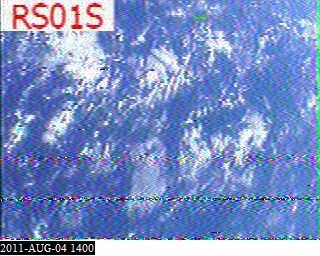 Green callsign is the top view [+Z pointing camera] and sometimes has the 2 meter antenna in view. 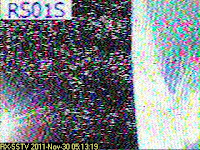 Blue callsign is the bottom view [-Z pointing camera]. Magenta callsign [+Y pointing camera, mirror reverses image]. 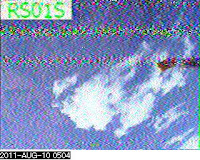 This nice image was received over North America by KJ4ZFQ. A nearly full frame shot of the earth and lots of clouds. This one appears to have been captured just prior to deployment by the cosmonaut and saved in memory for transmission later. Congrats to DK3WN for capturing this image. Some really interesting images are being sent by ARISSat-1 when it is not in eclipse. 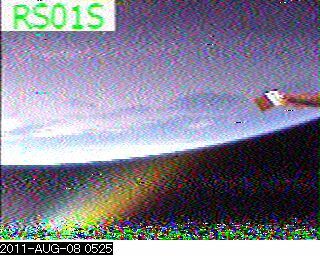 This one captured by G6HMS just after ø6øø UTC on Aug 4 show the curve of the earth. 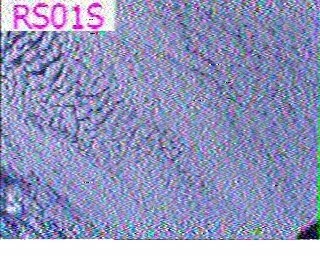 Many of the images have lines across them which is due to the satellite tumbling and causing some deep fading in the signal. A bit delayed but ARISSat-1 was deployed at 1843 UTC by Sergey Volkov. 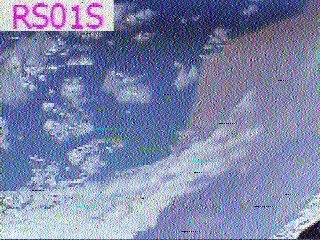 An initial report of the satellite has been posted from Japan. 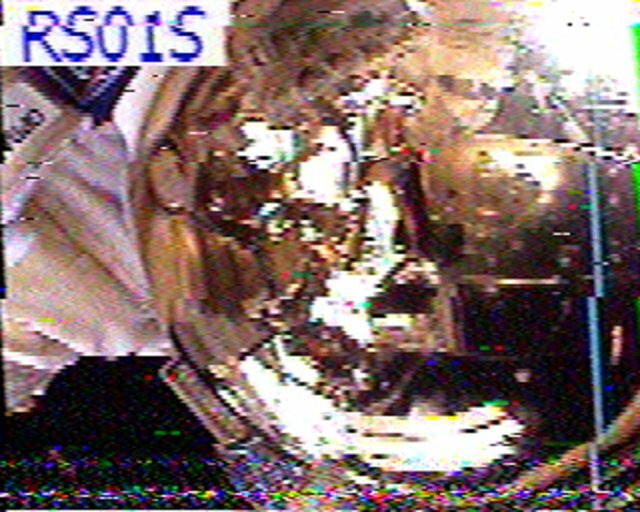 The ARISSat-1 satellite inside the ISS, was to be turned on and use an external antenna in celebration of the 50th anniversary of Yuri Gagarin's first manned space flight. 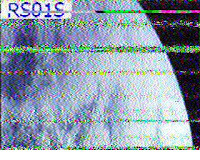 No ground stations reported hearing the signals. 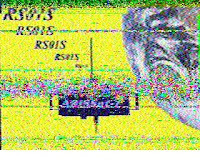 AMSAT is working with our Russian partners to determine any problems and assist in correcting them. 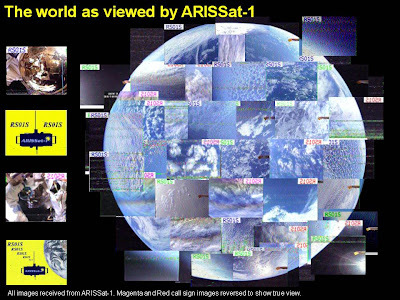 The ARISSat-1 signals can be experienced during the 2011 Dayton Hamvention (May 20-22) in the AMSAT booth and around the arena. AMSAT will have the operational prototype running and people there to discuss the satellite and its operation. Roscosmos has announced that the satellite will be deployed into orbit during the next EVA in llate July of this year. 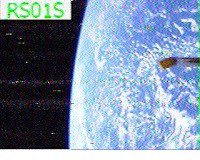 AMSAT has sent a bulletin providing information about the activation test for the 50th anniversary of human space flight. 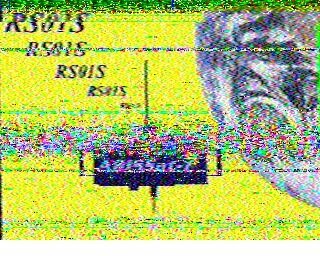 See www.amsat.org for all the details. The Russian team is planning to activate ARISSat-1 from inside the ISS again as part of the commemoration of the 5oth anniversary of the first human in space. The schedule currently lists preparation for activation starting at 1430 UTC on April 11. 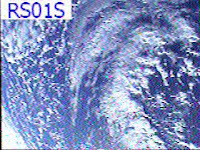 The system should be active several minutes later and will remain active until 1030 UTC on April 13. The small satellite is now planned for deployment from the ISS during a Russian EVA in July.